All it takes is one of these pretty plants—and this smart guide—to yield a bounty. Want to juice up your space, indoors and out, without spending a bundle? Think succulents! From the rosettes of Echeveria x imbricata (also known as “hen and chicks”) and spiky, striking Agave americana to good old aloe vera and jade plants, succulents’ plump leaves and lush colors are perfect for both landscapes and flowerpots. These easy-care beauties are also very forgiving of neglect. 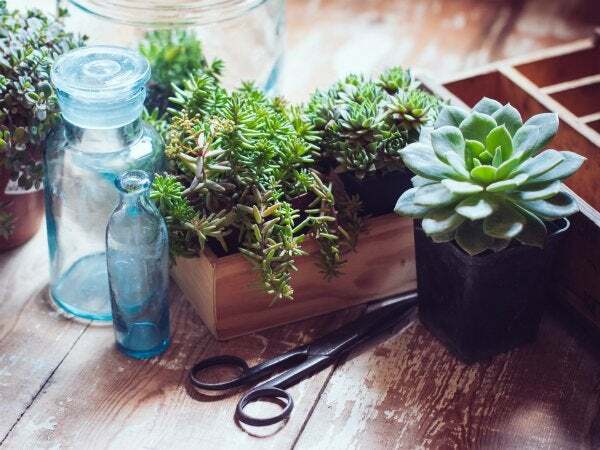 Perhaps best of all, you needn’t go out and buy a bunch: With a few simple materials and a bit of know-how, you can propagate plenty of new plants from a single succulent—one you may already own—using leaves or cuttings. Get started now! Gently wiggle a few leaves from the bottom portion of the stem, and then twist until they pop off. Aim for clean break, with no rips in the leaf. Discard any wounded leaves—they won’t root. Lay leaves on a paper towel or in a small dish, and set them in indirect sunlight for one to three days, until the ends have dried out and calloused over. Resist the urge to plant leaf ends before drying—they’ll absorb too much water and rot. STEP 2: Add soil and water. Put some cactus soil (available at nurseries, or make your own from potting soil or peat moss plus sand and perlite) in a small container. Lay dried leaves on top and mist them with water until soil is moist. 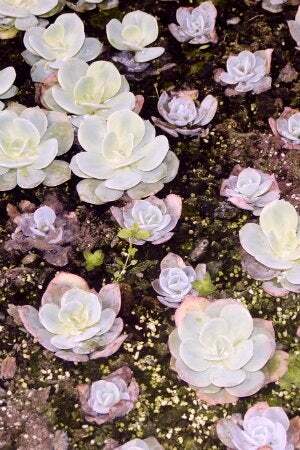 While full-grown succulents don’t require much water, leaves do—so check them often and re-mist as soon as the soil dries. Continue until small roots and a baby plant form at the cut end of the leaf. Every variety is different, so this may take anywhere from a couple weeks to a couple months. Be patient! Once a healthy baby plant has formed at the base of the leaf, transplant it into its own container. Fill this second container with cactus soil and make a small indentation with your finger. Put the roots of your newly propagated plant, with the leaf still attached, into the indentation and gently cover with soil. Mist it with water and place in a sunny spot. The original leaf will eventually shrivel and die, and you’ll be left with a brand new succulent to enjoy. STEP 1: Take a cutting. Using a pair of pruning snips or sharp scissors, cleanly cut the top few inches off of a “mother” succulent. Allow the end to dry out for one to three days until it callouses over. STEP 2: Push to plant. Simply push the calloused end of the cutting into a pot of cactus soil. Mist to water, place in full sun and let it to grow. STEP 3: Keep the stump. If your original succulent was small to begin with, after removing the bottom leaves and taking the top few inches for a cutting, you may be left with just a stump. Fret not! Simply put it in a sunny window, and once the cut end callouses, mist it with water. Eventually, new baby plants will begin to grow around the stem at its base. While not every leaf or cutting you take will root successfully, chances more than half will. Before you know it, you’ll be the proud propagator of multiples, with enough plants to decorate your home, patio, and garden, and even have some to offer as gifts.